The past two weeks have been a whirlwind of activity. 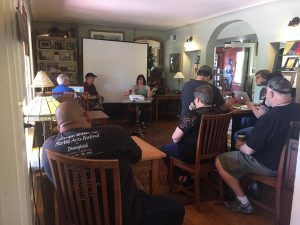 Here is a quick recent author appearances recap. 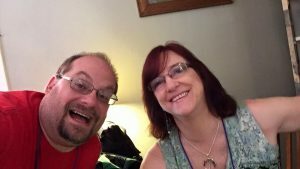 First, I attended the Cirque du Livre Writers Conference in Mesa, where I presented on with Alan Black, Deena Remiel, and Tom Leveen on topics that included creating antagonists readers love to hate, the best path forward on your publishing journey, and my process for developing a strong reader pitch. I also co-presented a first page read panel with Tom Leveen, where we gave on the spot critiques to writers. Of course, I also attended some great sessions on dialogue (Tom Leveen and Bruce Davis) and marketing (Deena Remiel and Alan Black) to name a few. 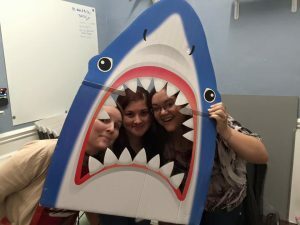 The Fabulous BrickCave Staff: Jenn LaBuz, Claudia Romero and Amber Gallagher. Cirque was a blast. Everyone learned and laughed and had a great time. Much collegiate camaraderie was shared. Overall it was a very positive and rewarding experience. In a fantastic turn of events, I was basically scouted and recruited to teach classes for the ASU Virginia G. Piper Center for Creative Writing. Stay tuned for more about that, as we nail down the details. Steampunk Writing panel with Gini Koch & Beth Cato, moderated by Edward Pulley. 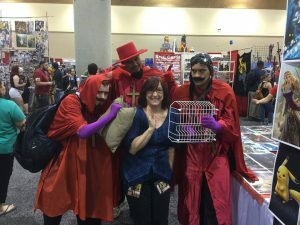 Immediately on the heels of Cirque came the multi-headed fantabulous beast known as Phoenix ComiCon where I had five panels, including one on writing Steampink with Gini Koch and Beth Cato, wonderfully moderated by Edward Pulley. I also had the opportunity to present with a diverse group of panelists, including Mark Rude, Ryan Dalton, Tim Shafer, Brenda Cranson, Cassandra Van Valkenburg, Na’amah Segal, Anita Marie Abundis, Jonathan Elliott & Cynthia Randall. 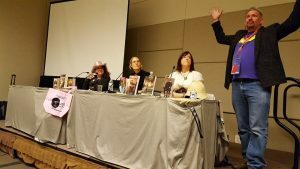 This year, my panels covered a diverse range of topics, including Urban Fantasy, writing from the female perspective, King Arthur in contemporary lit, magic, middle school and YA fiction, and, of course, Steampunk. Tried to get a book blurb from this guy, but he was too far gone in the throes of an ether binge. It was another huge year at PCC. The fans showed a lot of love and new readers were excited abut the books, as well. 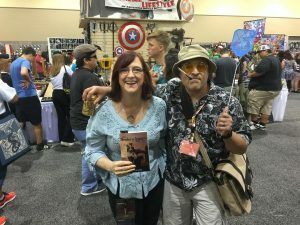 I had more than one person buy The Healer’s Legacy and begin reading it, then return for The Matriarch’s Devise before the Con was even over. Or, as in one case, to have a family member pick up the second book as a birthday gift. I sure didn’t expect these guys! As much as I love meeting and talking with my wonderful readers, I have to confess these events take a lot of energy and time. I haven’t written anything but this blog post in nearly a week. So, I am happy to get this posted and move back into focusing on my writing projects. With Cirque du Livre Organizer & Publisher, Bob Nelson. In addition to my other roles and responsibilities, I recently assumed the position of Regional Advisor for the Society of Childrens’ Book Writers and Illustrators (SCBWI) in Arizona. Over the next few weeks, you can find me working with a group of wonderful SCBWI Arizona members and volunteers to provide programming for our Arizona region. Many of these events will be open to both members and nonmembers. You can check out those upcoming events here. And remember, my upcoming appearances are always posted here. Till next time, may you always find the perfect words for all you wish to say. Next Article Next Article: How Much Glitter Does One Woman Need?